People who are positive often pursue what they believe to be liberating beliefs. They translate these into behaviour and aim to do their best. Some gurus urge people to focus on their so-called limiting beliefs, but taking this route can increase people’s self-doubt. Another approach is for people to focus on their liberating beliefs. Such beliefs need to be based on reality, of course, rather than wishful thinking. Bearing this in mind, people often go through the following steps to clarify their liberating beliefs. Looking back at your life, when have you pursued a liberating belief that enabled you to reach a goal? You may have done this when working to pass an exam, deliver a project or reach some other goal. Describe a specific situation in the past when you followed a liberating belief and translated this into positive affirmations. Describe the liberating belief and positive affirmations that you followed in the situation. 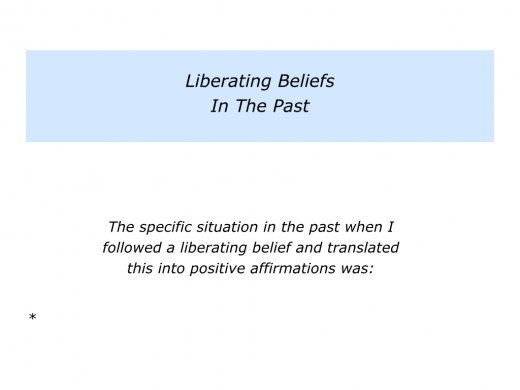 Describe the specific things you did to translate the liberating belief and positive affirmations into action. You will have your own approach to helping people to follow their liberating beliefs. People who use Appreciative Inquiry, for example, often invite clients to recall when they have performed brilliantly. 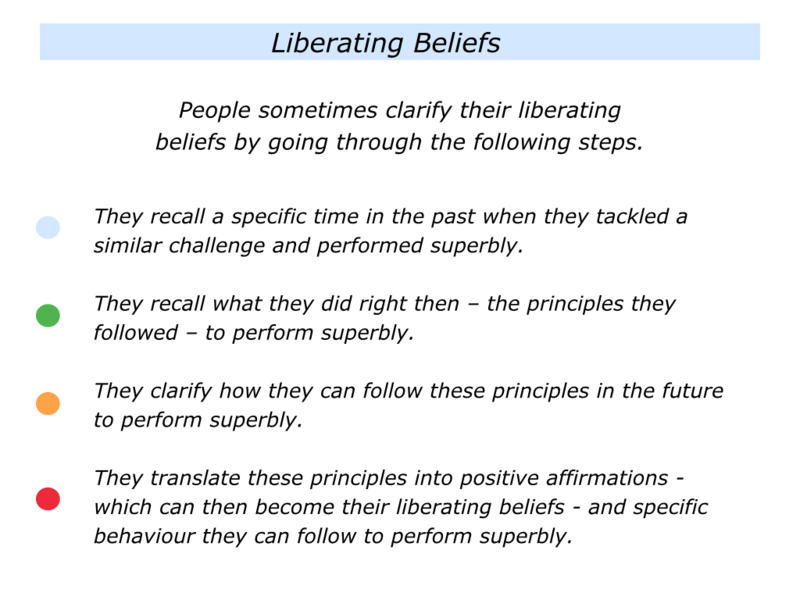 They then help people to translate these principles into liberating beliefs. Counsellors sometimes invite a troubled client to build on their inner resources. They invite the person to recall when they have overcome similar setbacks successfully. The client then develops belief from the gut. They have done it before, so they can do it again. Building on this feeling, they can follow similar principles to tackle the present challenge successfully. 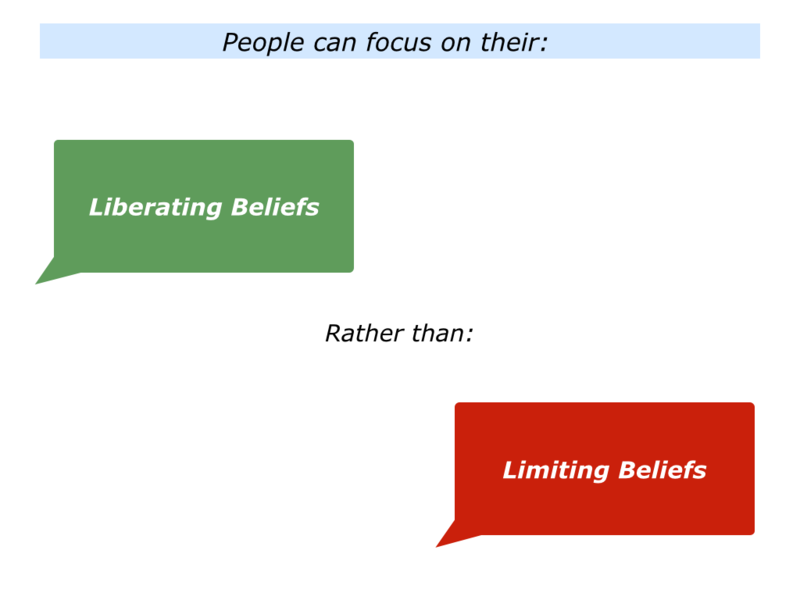 Different people use liberating beliefs in different ways. Looking at my own life, for example, I had the liberating belief that I could get out of the factory and get a job helping people. Leaving school at fifteen, I embarked on a six-year apprenticeship at Rolls Royce in Derby. Unfortunately I was not good at operating machines, so I tried to get a job doing some kind of social work. My liberating belief, however, was that I had fighting spirit and the ability to learn. One teacher encouraged me by saying she had seen that, when I put my mind to it, nothing would stop me reaching a goal. Spurred on by this belief, I spent the next few years educating myself at the local reference library. This led to leaving the factory the day before I was 21 and managing to get a job in an office. Another year of exploring many avenues led to being interviewed by Community Service Volunteers. They gave me the chance to work with mentally handicapped children. This eventually led to running therapeutic communities for teenagers. Let’s return to your own life and work. 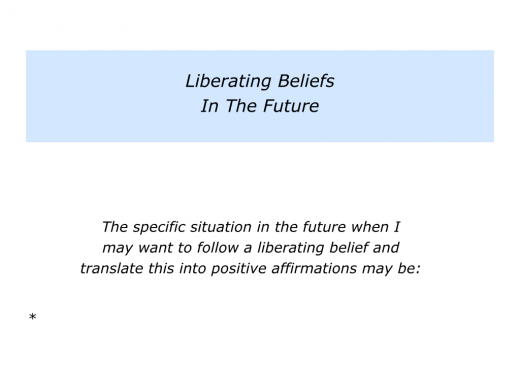 Looking to the future, can you think of a situation when you may want to follow a liberating belief? You may want to do this when taking the next step in your career, tackling a specific challenge or whatever. 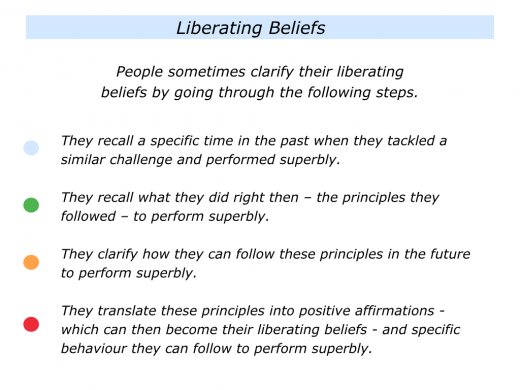 What is the liberating belief you would like to follow? If appropriate, how can you translate this into positive affirmations? How can you then translate these words into action? Describe a specific situation in the future when you may want to follow a liberating belief and translate this into positive affirmations. Describe the liberating belief and positive affirmations that you may want to follow in the situation. Describe the specific things you can do to translate the liberating belief and positive affirmations into action.